14-day money back guarantee for any reason, you change your mind about the course within 14 days of purchase, so long as you have not accessed the online course, you can claim a full no questions asked refund. Secure Payments & Secure Servers Secure Payments can be made by all major debit or credit cards via our Secure Servers. If you change your mind about the course within 14 days of purchase, so long as you have not accessed the online course, you can claim a full no questions asked refund. Bulk Discounts for Businesses - Click Here! Owning a business requires a vision balanced with attention to detail. You need to be a generalist who understands the multiple aspects of running a business, as well as the ability to step back and see the big picture and to reach into the future. The business environment is a complex place to be. Whether you wish to work as a consultant or freelancer, establish a corporation, or set up an operation that meets a need for very particular type of customer, there is a tremendous amount of information that you need to know and to apply. This course provides essential learning for new business owners, whether the business is just in the idea stage or you have already begun and need to fill in the gaps. We are an accredited and trusted leading provider across the UK. We have extensive experience in various private and public sectors environments. The online nature of the courses means that they are affordable, but do not compromise the quality. We offer over 100 online training courses, developed specifically to meet the needs of individuals to meet both their responsibilities and job roles and are ideal for induction, awareness, knowledge and refresher training. Once you have completed the learning you will participate in a multiple-choice assessment, a pass mark of 75% is required. The online test is marked automatically, receiving an instant grade. Don’t worry if you don’t pass or want to improve your grade, you can retake the test unlimited times at no extra cost. HL Online Training Provides continuing professional development (CPD) interactive accredited training courses online for both individuals and businesses allowing you to obtain certified CPD hours. All our courses are accredited by the Continuing Professional Development (CPD) and are nationally recognised. Once you have completed your assessment you will be awarded a free accredited certificate in PDF format which is immediately available. Hard copies of the certificate are available at an additional fee of £3.99. All evidence of learning and certification will remain on our system for your future reference. The course is delivered online via our bespoke e-learning portal, complete with both online “classroom” style and interactive user-friendly training and downloadable documentation to aid your learning. You can resume or stop your course at any time, remembering the exact point you were at. This does depend on the level and experience of the individual, as a guide a level 1 takes 1 hour, level 2 takes 2 hours and level 3 takes 3 hours as an average to complete each course. You have 12 months to take the course, however, there is no time limit in which you need to complete the course. It’s good to know help is at hand. We take pride in our customer service, offering dedicated tutor support offering you unlimited online email support whilst studying to help answer any questions you may have. Our courses utilise a responsive design making it available on your desktop, laptop, tablet or mobile Device. We recommend using the Google Chrome Browser. The online Basic Business Management – Boot Camp for Business Owners training course comes complete with a multiple choice exam and a nationally recognized CPD Certificate. Once you have completed the learning you will participate in a multiple-choice assessment. A pass mark of 75% is required. The online test is marked automatically, receiving an instant grade. We offer an unlimited pass guarantee. Don’t worry if you don’t pass or want to improve your grade, with our unlimited pass guarantee can retake the test as many times as you wish to at no extra cost. All our courses are accredited by the CPD and are nationally recognised. Once you have completed your assessment you will be awarded a free accredited certificate in PDF format which is immediately available. The certificate will display the CPD logo as proof of your knowledge and competencies gained from taking this course. Hard copies of the certificate are available at an additional fee of £3.99. These are purchased once the course is completed online. All evidence of learning and certification will remain on our system to peruse for your future reference. Hello We are looking for a new elearnign platform to provide refresher training for our carers and nurses, last year we purchased 3000 credits, can you provide me courses and prices? Yes, please send us your quote and we will look to match anything similar. Return to the Dashboard and going to the middle button the on the right marked Manage Learners. This will take you to a page which lists all your learners. It will state, the name, email address and when they last logged in. Next to the box marked Assign, there is a button marked Learner Report. Click on the download button and an Excel Spreadsheet will appear which lists all the courses you have assign to the learner. It will tell you whether they have opened the course, how far they are from completing the course, how many attempts they have taken to complete it, their percentage pass and whether their certificate it available. To view/print, the learner’s certificates press the “Request Certificates” button. Once you have bought the course you wish your learner to complete, you need to assign the course to them. From the dashboard, select the top right button which says Manage Courses from the dashboard. Click on the button in the middle of the boxes which says Add, the name will then transfer into the box called Learners Assigned. Click the blue button at the bottom of the page which says Save Changes. A Green box will appear at the top of the page saying that The Changes Have Been Made. An email will automatically be sent to your learner informing them that there is a course waiting for them to complete if set up via an email address. Select courses individually from either the “CPD Online Courses” tab, or the Care Certificate from the “Packages” tab. Scroll down the page and click Place Order and continue to payment method. Go to the middle left box on the white side of the page which says Create Learner. If no email is entered an access code will be created, you will find this code from the manage learners page. Please send them the login page link and access code. At the bottom of the page tick the box which asks to confirm that you have read the policies and then click on the blue button that says Create Learner. A green box will appear at the top of the screen informing you that your learner has been added to your hierarchy. At the top of this page, there is a download tab where you can download a CSV file. Fill out this information, save the document, then click Upload CSV file and all your learners will be added. Should you have any issue logging in please reset your password or select “Create A New Password” from the login page and your details will be resent to you. I have drafted a guide on how to use our system. Please watch this training video overview. It is broken down into smaller sections below for your convenience. If you have any issues with logging in or using the system then please contact the SUPPORT TEAM – you will see a red button on the bottom left-hand side of every page on the training system which is titled support. For any sales enquiries please get in touch with me directly. I hope this walk through has assisted you and that you continue to use it to enhance your learner’s training. Please feel free to contact me for any further assistance. Do I get reports and an audit trail? All evidence of learning and certification will remain in our system for your future reference, easily keeping track of candidates. A learner matrix is also available detailing dates of course access, progression, grade, amount of attempts and login times. You have access to this saving you both time and paperwork. What are the key management functions available? We take pride in our customer service, offering dedicated Tutor Support via email, online messenger, and telephone. The courses come complete with both online “classroom” style training and downloadable documentation to aid the learning. A Certificate is available immediately upon completion. All evidence of learning and certification will remain in our system for your future reference. A learner matrix is also available. You have access to this saving you both time and paperwork. You are able to access training courses on a desktop, laptop, tablet or mobile device no fixed term contract. Do I need a class room, room hire or a trainer to deliver the courses? What are the benefits of using a learner management system? Can I get a discount for my business/charity? We offer a discounted price structure from as low as 99p, please get in touch and we will assist in working out the most competitive way on how we can save you money on your training budget and help with compliance. As a business can the manager receive the certificates, not the learners? Yes, You can turn off the option for the learner to receive certificates, meaning only the business will have access to them. How much do the certificates cost for candidates and my staff and what is displayed on them? Once they have completed the assessment they will be awarded a free accredited certificate in PDF format which is immediately available to print. You can turn off the option for the learner to receive certificates, meaning only the business will have access to them. Can I share the course information on my intranet or similar? No. To download, store, archive, rip or anything like this is illegal. We have sophisticated tracking software imbedded in our material to protect our interests. How do I get a receipt for payment? A receipt is emailed to you upon purchase. What if I can not pay with a debit or credit card? Don’t worry, we will raise an invoice that can be paid directly into the bank account, please contact us and we will arrange as appropriate. Can your online training courses improve my CQC rating? We take pride in helping businesses to remain compliant, refresh training and obtain reporting. Our system will assist in keeping the house in order giving a solution to aid with compliance and training. We welcome you to ask us for other clients we have helped and hear it first hand how other companies have benefited. Can more than one person train on the same course? Each credit is per course per learner with the certificate and reporting modules stating the learner’s name and record of progression. This aids compliance and keeps reporting in one place, saving you both time and paperwork. Example, you have 5 learners that need fire safety. You would purchase 5 fire safety courses and allocate 1 course individually to each of the 5 learners. Can I have a free course to sample the quality of your training? We are confident you will love what we offer and would be happy for you to see the system and the courses. Please get in touch and we will arrange a free training course for you. How many learners do you have? What If I have a lot of staff members needing courses? We will give you full training and guide you on how to maximise the system and the courses for your business. The more you purchase, the greater the savings. I have several staff, how many credits do I need to purchase? It is 1 credit per learner per course. Example, you have 10 learners that need 5 courses each, you would need 50 credits. (10 learners x 5 courses = 50 credits). These can be purchased on a pay as you go or bulk purchase, we leave you with the flexibility of choice. A credit is for the allocation of 1 CPD course per learner. A credit does not expire. This is applicable to CPD courses, ebooks and video learning. Once the credit is allocated the learner will have 12 months to action the course. A credit does not cover a qualification or the care certificate package. These are purchased separately. What are the price for the online training courses? Prices start from 99p per user, or £1.49 per course. See our pricing page for more details. A member of the team will help to see the best options to ensure a cost-effective plan is in place. How much is the cost to use the Learner Management System? We do not charge any fee to use the LMS. It’s free to use. I want to buy a video course, ebook and interactive training course at the same time? When refresher training is due, can a report be run for the individual? Yes, the system automatically emails you a reminder from 12 weeks before the refresher training is due. You have the function to turn these alerts off. The matrix report covers full details including the dates of training. This can be downloaded and filtered as appropriate. My account has been set up but I`ve not received an email? On occasion our emails may slip into your junk or spam folder, please check this in the first instance. You can request a password reset here. Your details will be resent to you. Alternatively please get in touch and we will be happy to resolve any questions you may have. How quickly can I start using the learner management system for my business? Setup can be actioned in 1 minute or less, at which time your login will be emailed to you and you will be ready to go. Remember help is on hand for any questions you may have. The system has been built with the user in mind, making it friendly and easy to use! We offer full support and guides, help is at hand should you need it. How do I set up a business account? Get in touch with us on 0203 770 2026 or email vicky@www.hlonlinetraining.co.uk. We will help your business to work out the best solution to help you remain compliant, stay within your training budget and how the management system can reduce both paperwork and save time. Why Should I use HL Online Training? We specialise in accredited Online Training Courses for a variety of subjects including Health & Social Care, Human Resources (HR), Health & Safety, Food Hygiene & Safety and soft skills. Online training makes the courses more affordable and accessible for all without compromising quality. You will be able to learn at a time and pace that suits you or your employees. Our system comes with a simple-to-use Learning Management System with powerful reporting tools, and is designed to reduce both your administration burden and training costs. How long are the certificates valid for, what is the expiry on them or when do they expire? The certificates do not expire however best practice suggests a renewal period of 3 years for training. The recommended renewal date of is printed on your certificate. Please check with your employer for their best practice and renewal policy. Are you courses high quality? I work night’s, should I attend training after working a night shift? Can I see a Certificate? Do you have free courses on offer? We offer free courses periodically, to receive details of these please sign up for our newsletter. All our courses have free certificates. What is included in the Care Certificate Package you offer? Do I need to complete a level 1 or level 2 qualification in care before I take level 3? To take the Level 3 qualification, you must be working in a care setting already. For the Level 2 qualification, you may have no previous experience, or you might be working in care and want recognition for your current skills. Do the CPD accredited courses meet the requirements of Ofsted ? Our courses refresh on current training, increase awareness or further develop knowledge. Whilst they follow frameworks they are not part of Ofsted. I am looking at starting a career as a healthcare assistant. With no previous experience what is the best course for me to do? How many courses and certificates do I receive? Do you do NVQ health care for carers? Can you please tell me the duration of your HCA health care assistant course? Is the PDF certificate is included in the course fee? Yes, the certificate is included in the price of the course. I would like to do some free courses in the health and social care sector. Would you provide free courses and certificates? Can I have the Answers to my course? We are CPD accredited and cannot give out the answers. please revise the learning. Are your courses OFSTED Certified? Is the exam included in the price? The exam is included in the price. Exam retakes – We offer unlimited retakes at no extra cost. What format and types of courses are available? Elearning –  This means using a computer or laptop to deliver part of, or all of, a course, whether it’s in a school, part of your mandatory employee training, or to further your own career at home. E-Books – E-Books are electronic versions of e-learning courses, usually in PDF form, which can be read on a computer, a laptop, or a specifically designed handheld device, for example tablets. Video Learning – Video learning is a useful alternative to e-learning as videos can be shown to large groups of people, which can be very useful in classroom based learning and work-based courses. Can I leave my course half way through? You have the ability to control the pace of learning. The course features automatic bookmarking allowing learners to take a break and return to the learning at the point they left off. Do your courses meet regulatory compliance? How long do I get to access my course? Are your courses short or abbrievated verison? No, Our statutory, mandatory and specialist care training courses are delivered in line with the relevant UK legislation and recommended practice mapped and aligned to the QCF framework and the below organisations. When do I need to retake the course? It depends on the course type, national guidelines, legal requirements and the  Inspectorate. There is no one simple answer to this question.Refresher training immediately accessible, standards compliant and very affordable. Can I reprint my certificate? All evidence of learning and certification will remain on our system to peruse for your future reference and is available from your dashboard. How long do I need to wait for my certificate? 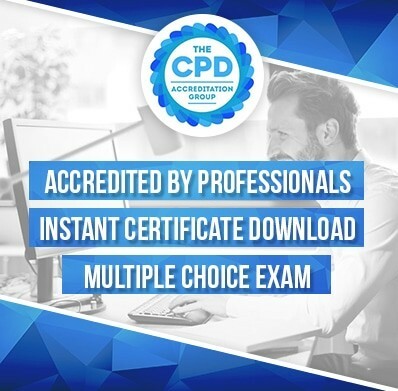 Once you have completed your assessment you will be awarded a free accredited certificate in PDF format which is immediately available to download and print. Hard copies of the certificate are available for an additional fee of £3.99. These are purchased once the course is completed online and sent in the post. Do I need to pay for my certificate? Once you have completed your assessment you will be awarded a free accredited certificate in PDF format which is immediately available to print. Hard copies of the certificate are available for an additional fee of £3.99. These are purchased once the course is completed online. Will I get a certificate and is it recognised? 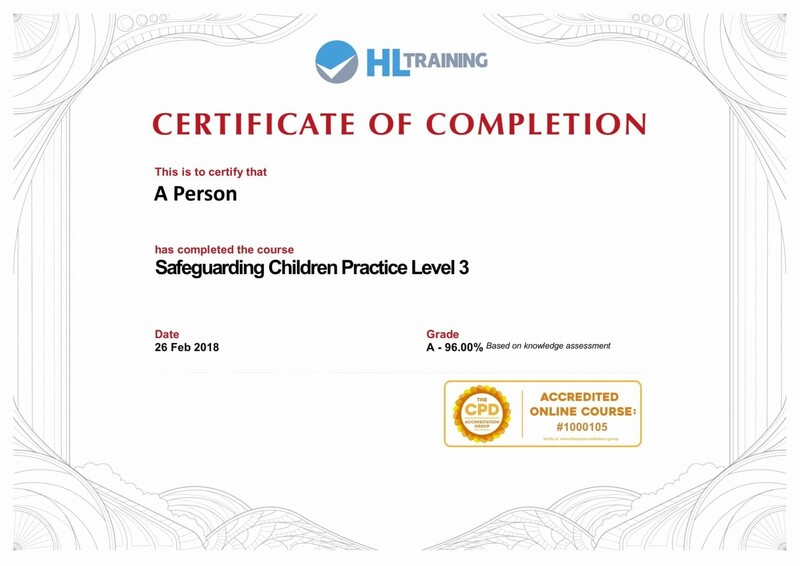 Once you have completed your assessment you will be awarded a free nationally recognised accredited certificate in PDF format which is immediately available. What If I fail? Can I retake the test at no extra charge? Don’t worry if you don’t pass or want to improve your grade, with our unlimited pass guarantee can retake the test as many times as you wish to at no extra cost. Is there a pass mark? Will I take a test? At the end of the learning, you will be given a multiple choice test. At the end of the test, you will be graded and a nationally recognised certificate is issued. How long does the course take ? F0r the CPD accredited courses as a guide, level 1 is 1 hour, level 2 is 2 hours and level 3, 3 hours. When can I access my online training course? Is the site secure for payments made? Can I use a tablet, laptop, desktop or mobile device? 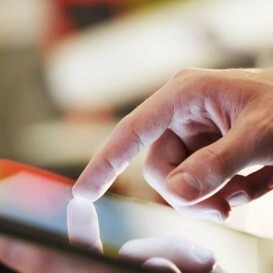 Yes, the courses are responsively designed meaning they will function on all devices. Where can I purchase further courses from? You can view all of our courses here https://www.hlonlinetraining.co.uk/online-courses/ Our courses are brought individually , we do not charge a subscription. How do I reset or get my password resent for the training course? Click ‘Create a New Password‘ and follow the instructions, the system will send you a password reset link. What is the link for my training course? Please raise a support ticket to contact us with the correct details and we will get this rectified. Speak to your line Manager/ Employer or the Company you bought the course(s) from. If you need further help, please raise a support ticket to contact us. I cant login using my Access Code? Check that the access code is correct making sure you check all the characters are correct, if you’re not sure, ask the person who gave you the access code to double check it from their ‘Learner Management Screen’. If you have logged in before with the access code, updated your details and added your email address, the access code will no longer be valid as your email will now be needed to access your learning account. Check your emails for a message titled ‘You have successfully updated your details!’ as this will have been sent to your email with instructions on how to create a password or just click on the ‘Create a new password’ button on the login page and follow the instructions. I cant login using my email address? I would like to work in people’s homes as a care worker but I don’t know the course to have, what advice do you give me? Is this care certificate transferable to use if I was to go to another place of work? 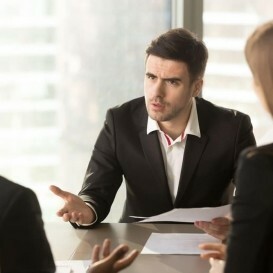 You would only need to do the learning once, however, the business would use the competency assessment tools to show competence in the workplace. Our portal will keep your certificate and grades on the system to view at a later date. I do private care live in and interested in purchasing courses for myself Can I do that? I have no training in a hca but its something I have always wanted to do and work with children what training do I need? What is the procedure for the care certificate? Only once all 15 online courses are complete with certificates and all 15 workbooks are completed in full can you issue learner with the Care Certificate. Can I have more information regarding the care certificate? Mandatory training refers to the compulsory training that is required for employees to carry out their duties safely and effectively. Many organisations deliver mandatory training as part of their routine induction training, then as required thereafter. This may be refresher training annually, or mandatory training updates every 2-3 years. This training may then be referred to as ‘mandatory training update’ or ‘refresher mandatory training. Are your health & social care courses aligned with the skills for health core skills training framework (CSTF)? Is the certification awarded for the mandatory training acceptible for inspection and auditing wthin the healh & social care frameworks? Our statutory, mandatory and specialist care training courses are delivered in line with the relevant UK legislation and recommended practice mapped and aligned to the QCF framework and the below organisations. Please ask us for recommendations from other businesses for how it has improved their inspection ratings, helped with passing audits and remaining compliant. £8.32 £9.98 Inc VAT Sale!